We just caught wind of the Golf Channel giving away a dream trip for Father’s Day this year. From now until Father’s Day on Sunday, June 16, the Golf Channel will celebrate the special connection between fathers and their children with prizes, Father’s Day-themed programming and lots more. Trips of a lifetime will be awarded to 4 lucky fathers and their sons or daughters to Philadelphia to compete in the Golf Channel Father’s Day Open. This is a celebrity-filled tournament that takes place on Monday, June 10 and is followed by a week at the 2013 U.S. Open Championship at Merion Golf Club in Ardmore, Pa.
You can enter the contest by visiting GolfChannel.com/Fathersday and uploading your favorite photo with your father or father-figure. For full contest details visit GolfChannel.com before Sunday, May 5. 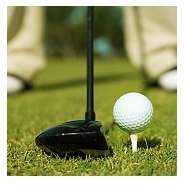 At Myrtle Beach Golf we know it makes a big difference where you buy your golf packages. We know how important getting your ideal Myrtle Beach tee times for your group can be. That’s why we have so many packages and provide you with such a large assortment of championship courses to choose from. There are over 110 courses in the Grand Strand area alone for you to select from. The more courses you have to choose from the better your chances of finding the exact Myrtle Beach tee times that you’re looking for. Booking your golf packages and scheduling your tee times is easy on our website. Just follow the tab marked “Book Online” and it walks you through the process. If you run into any problems just give our golf specialists a call at 800-422-1587 and they’ll assist you in any way they can. This entry was posted in Myrtle Beach Tee Times and tagged Father’s Day, Myrtle Beach Tee Times. Bookmark the permalink.